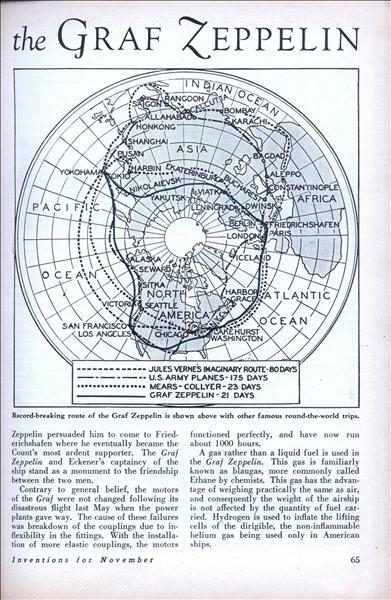 Circumnavigating the globe in 21 days, the Graf Zeppelin has broken all records for speed in traveling around the world. 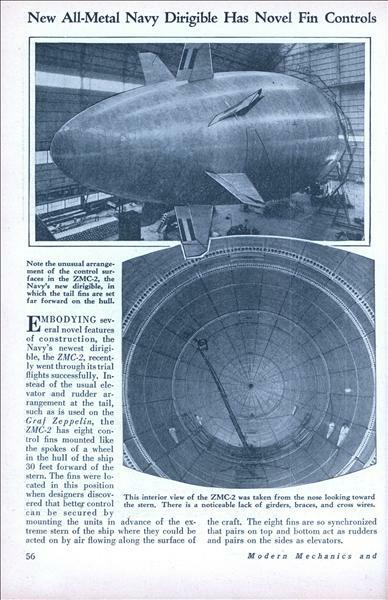 Little known facts concerning the giant airship, its commander, and the world flight are presented below. 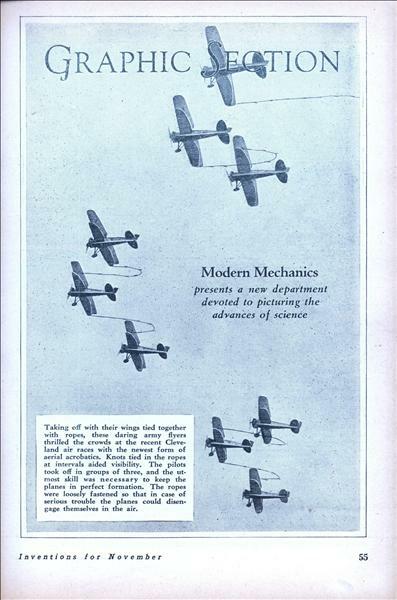 Modern Mechanics presents a new department devoted to picturing the advances of science. Taking off with their wings tied together with ropes, these daring army flyers thrilled the crowds at the recent Cleveland air races with the newest form of aerial acrobatics. Knots tied in the ropes at intervals aided visibility. 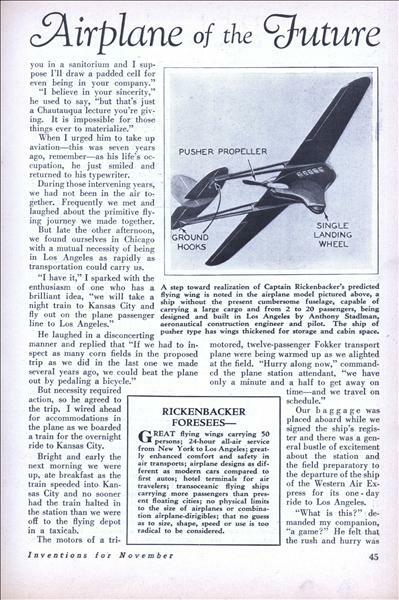 The pilots took off in groups of three, and the utmost skill was necessary to keep the planes in perfect formation. AFTER five years of experimental breeding among chickens, Dr. R. T. Renwald, Omaha laboratory technician, has produced a species without wings or toenails. 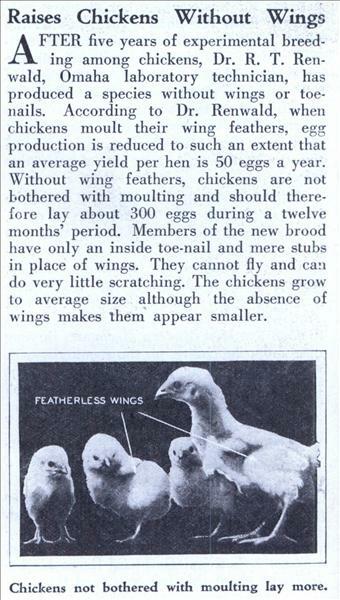 According to Dr. Renwald, when chickens moult their wing feathers, egg production is reduced to such an extent that an average yield per hen is 50 eggs a year. UNLESS a tramp poodle dog is lucky as a hitch-hiker he needs boots for a cross-country hike. 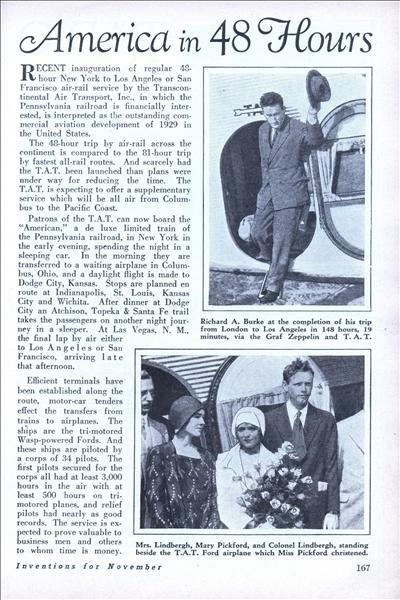 C. C. Maupin, of Philadelphia, left New York on a hike to Los Angeles. 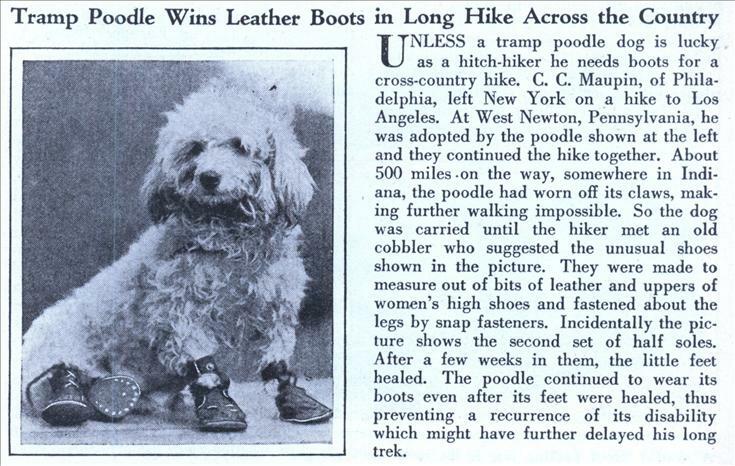 At West Newton, Pennsylvania, he was adopted by the poodle shown at the left and they continued the hike together. 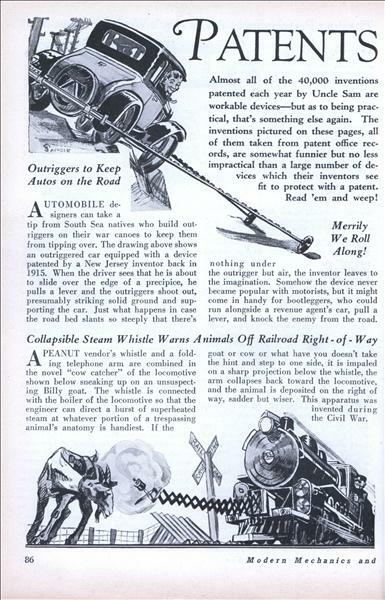 About 500 miles on the way, somewhere in Indiana, the poodle had worn off its claws, making further walking impossible. 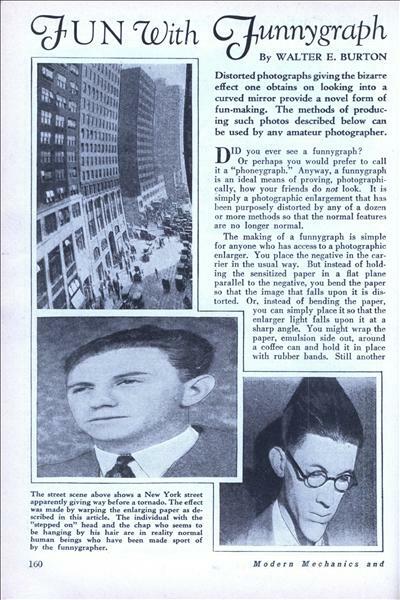 By WALTER E. BURTON Distorted photographs giving the bizarre effect one obtains on looking into a curved mirror provide a novel form of fun-making. The methods of producing such photos described below can be used by any amateur photographer. DID you ever see a funnygraph? 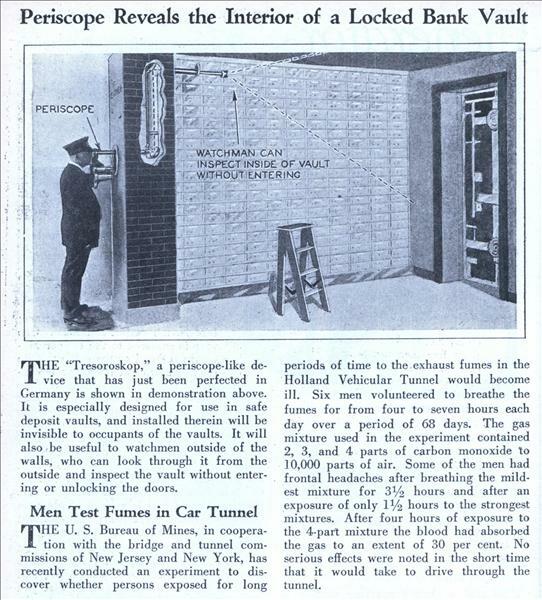 Or perhaps you would prefer to call it a "phoneygraph." Anyway, a funnygraph is an ideal means of proving, photographically, how your friends do not look. It is simply a photographic enlargement that has been purposely distorted by any of a dozen or more methods so that the normal features are no longer normal. 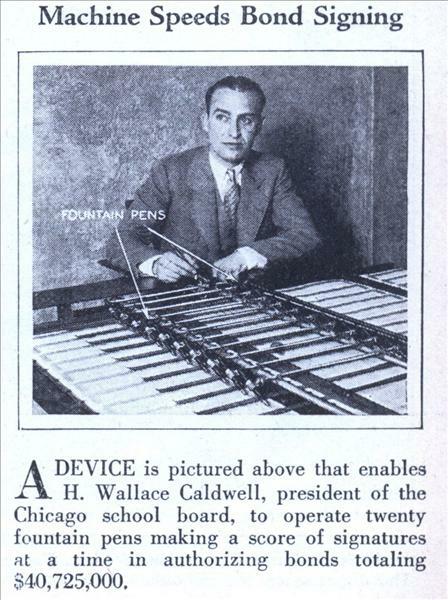 Machine Speeds Bond Signing A DEVICE is pictured above that enables H. Wallace Caldwell, president of the Chicago school board, to operate twenty fountain pens making a score of signatures at a time in authorizing bonds totaling $40,725,000. Remarkable Aerial Photos of Manhattan's Ever - Changing Skyline. Photos by Ewing Galloway Mountains of Brick and Glass! 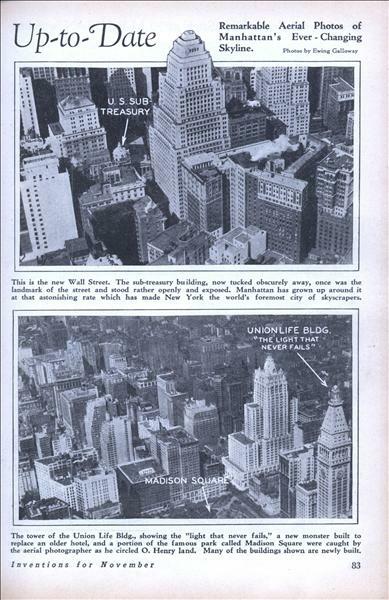 That is what O. Henry might have called these man-made skyscrapers. Here is an air shot looking directly down Fifth Avenue. New buildings are pointed out. Here's how the famous Battery looks to an airman. The new financial district, the winding 6th Avenue Elevated line and the Staten Island ferry piers can be seen. A symphony in architecture! 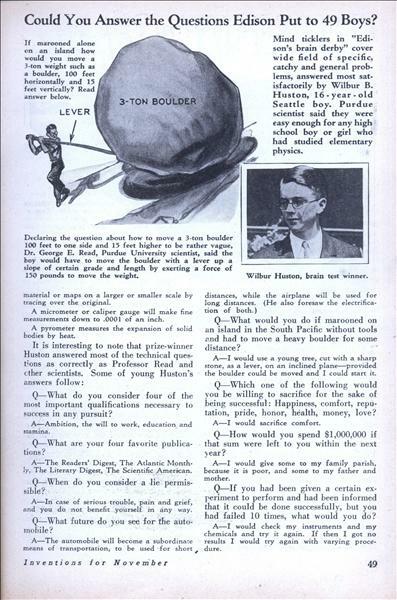 Mind ticklers in "Edison's brain derby" cover wide field of specific, catchy and general problems, answered most satisfactorily by Wilbur B. Huston, 16-year-old Seattle boy. Purdue scientist said they were easy enough for any high school boy or girl who had studied elementary physics. FORTY-NINE boys, hand picked from among pupils in high schools through-cut the country, spent five hours in answering a questionnaire drawn up by Thomas Alva Edison, the famous inventor—a set of questions which would prove sticklers for many of their elders. The examination represents a searching test, not only of the practical education of the applicants for the scholarship offered by Edison, but also of their ideals, character, resourcefulness and practical understanding of usual conditions and general information. 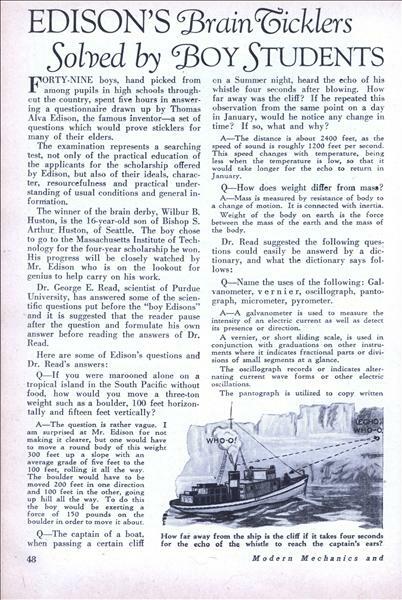 The winner of the brain derby, Wilbur B. Huston, is the 16-year-old son of Bishop S. Arthur Huston, of Seattle. The boy chose to go to the Massachusetts Institute of Technology for the four-year scholarship he won. His progress will be closely watched by Mr. Edison who is on the lookout for genius to help carry on his work. By ALFRED ALBELLI Television in color is now an accomplished mechanical fact. 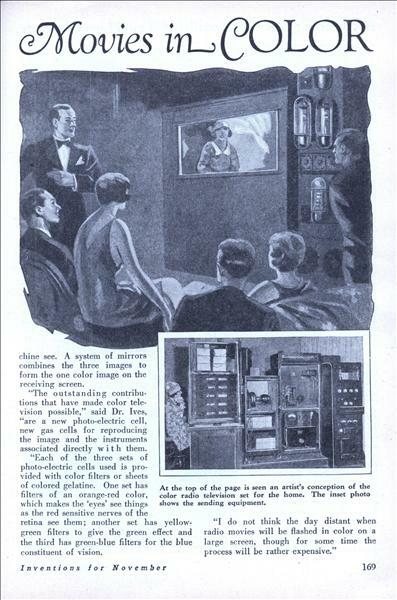 Mr. Albelli, in this article, tells how the broadcasting device works and points out the possibilities of color radio movies for everybody. 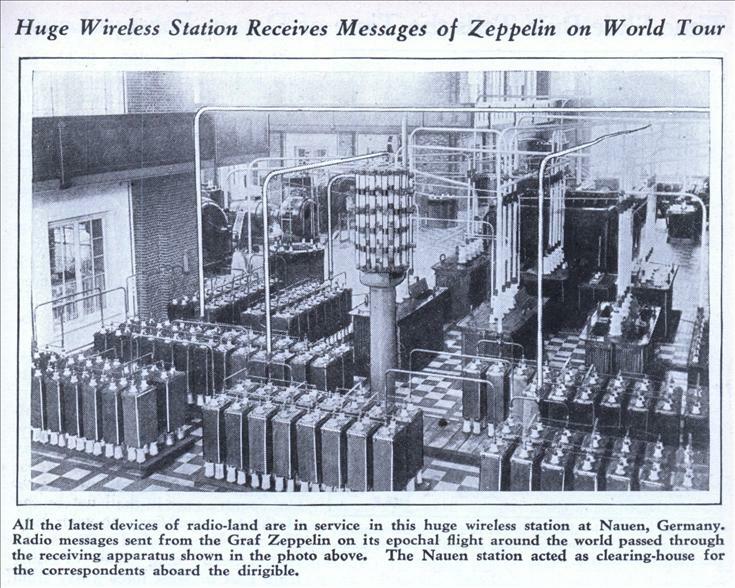 RADIO movies loom as a strong possibility now that color television has been reached. 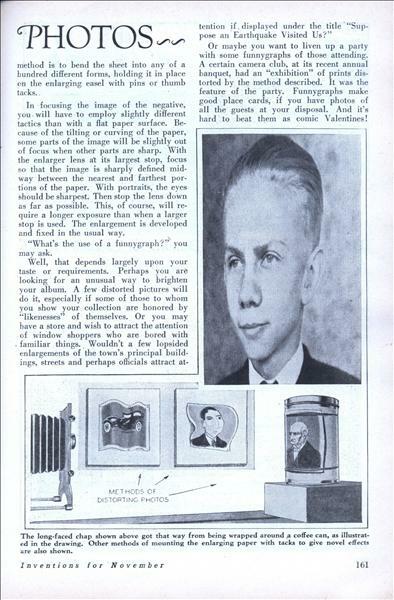 The man who forecasts motion pictures by radio is none other than Dr. Herbert Ives, research engineer at the Bell Laboratories in New York City. By 1st LIEUT. 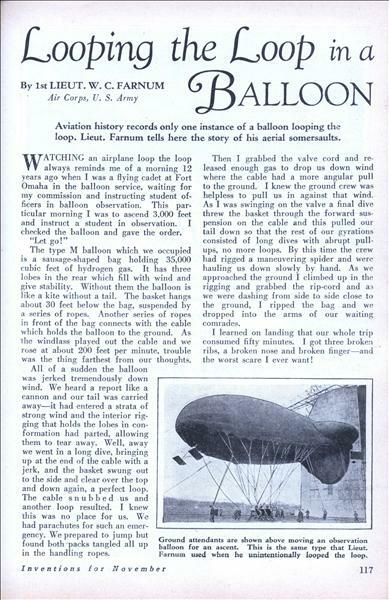 W. C. FARNUM Air Corps, U. S. Army Aviation history records only one instance of a balloon looping the loop. 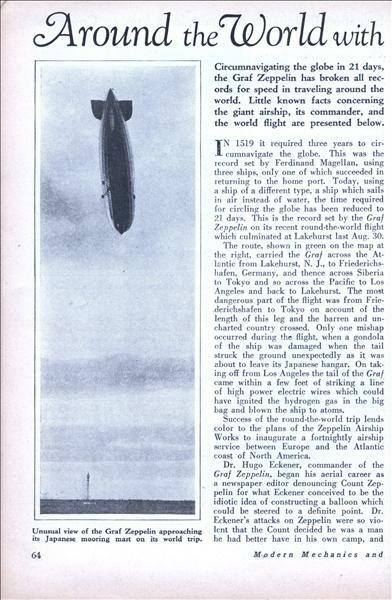 Lieut, Farnum tells here the story of his aerial somersaults. WATCHING an airplane loop the loop always reminds me of a morning 12 years ago when I was a flying cadet at Fort Omaha in the balloon service, waiting for my commission and instructing student officers in balloon observation. This particular morning I was to ascend 3,000 feet and instruct a student in observation. 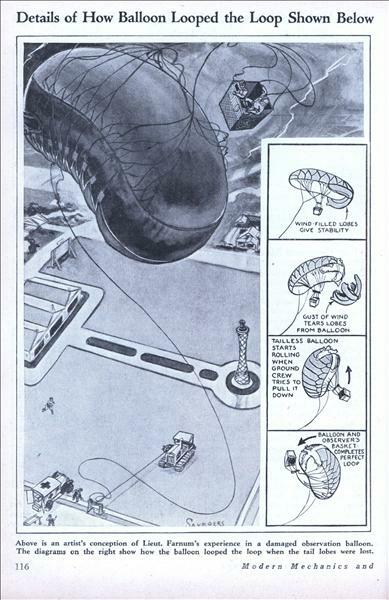 I checked the balloon and gave the order. WILL science ever be able to take photographs of the spectra of the sun and other stars with cameras far outside the range of the earth's atmosphere? 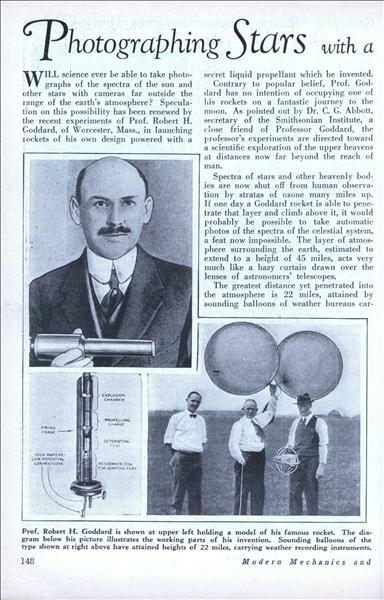 Speculation on this possibility has been renewed by the recent experiments of Prof. Robert H. Goddard, of Worcester, Mass., in launching rockets of his own design powered with a secret liquid propellant which he invented. 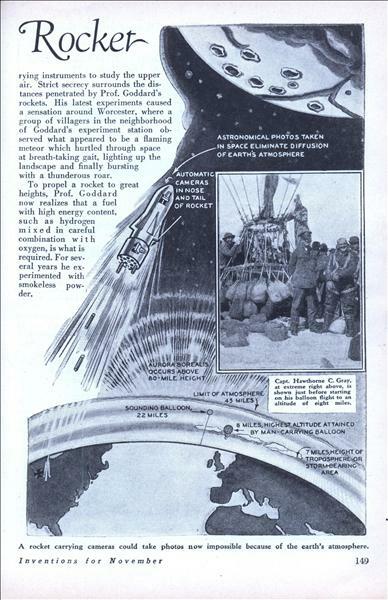 Contrary to popular belief, Prof. Goddard has no intention of occupying one of his rockets on a fantastic journey to the moon. 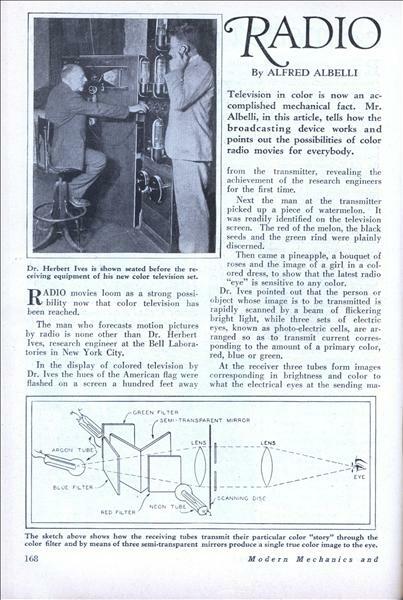 As pointed out by Dr. C. G. Abbott, secretary of the Smithsonian Institute, a close friend of Professor Goddard, the professor's experiments are directed toward a scientific exploration of the upper heavens at distances now far beyond the reach of man. 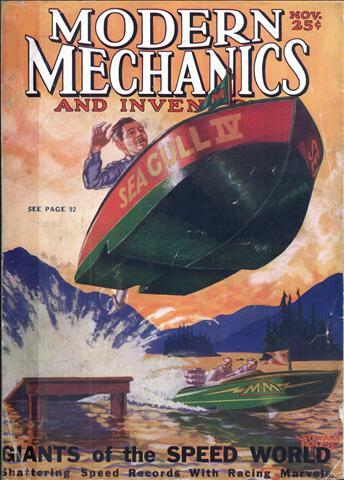 Almost all of the 40,000 inventions patented each year by Uncle Sam are workable devicesâ€”but as to being practical, that's something else again. 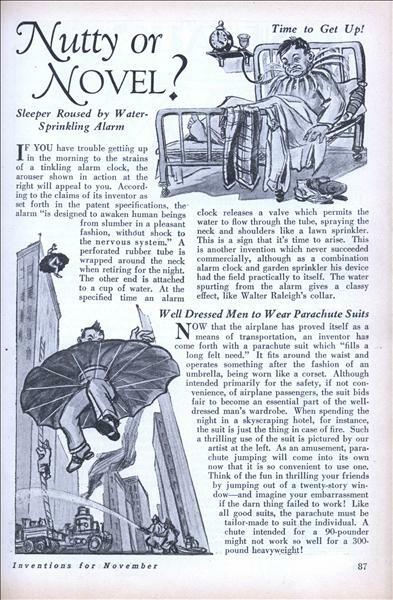 The inventions pictured on these pages, all of them taken from patent office records, are somewhat funnier but no less impractical than a large number of devices which their inventors see fit to protect with a patent. Read 'em and weep! 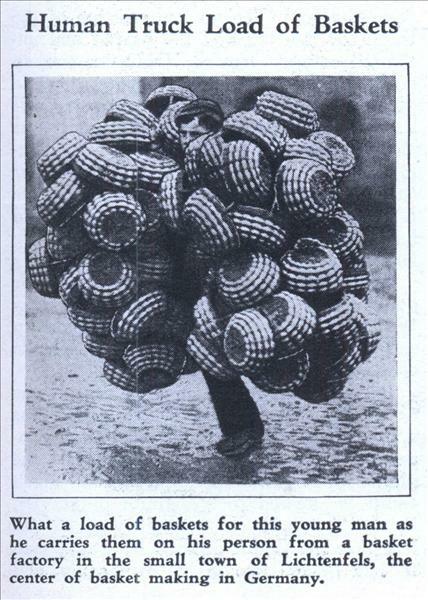 Human Truck Load of Baskets What a load of baskets for this young man as he carries them on his person from a basket factory in the small town of Lichtenfels, the center of basket making in Germany. By CAPT. 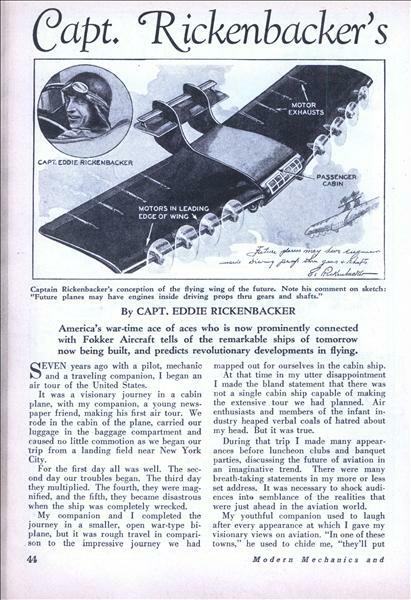 EDDIE RICKENBACKER America's war-time ace of aces who is now prominently connected with Fokker Aircraft tells of the remarkable ships of tomorrow now being built, and predicts revolutionary developments in flying. 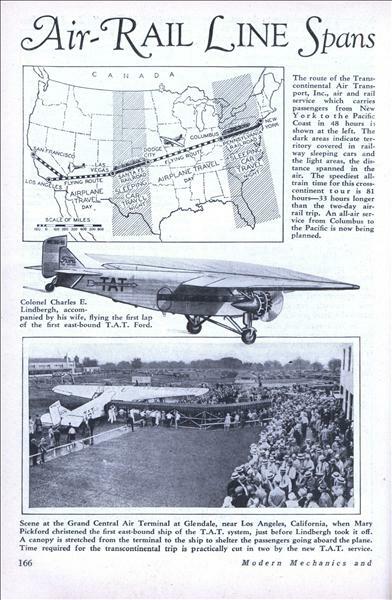 SEVEN years ago with a pilot, mechanic and a traveling companion, I began an air tour of the United States. 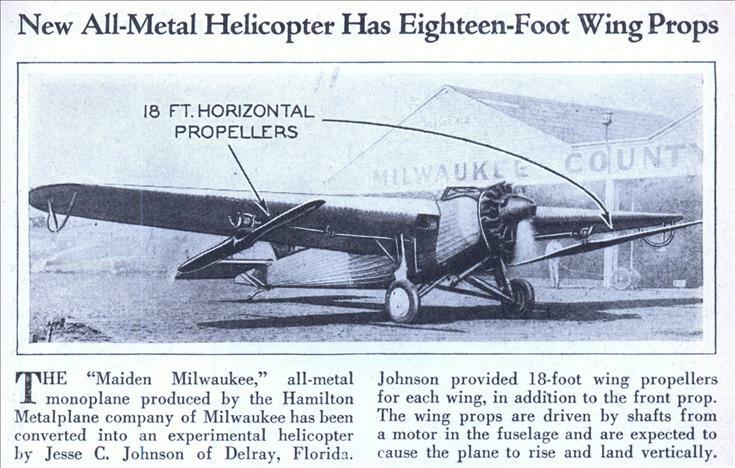 It was a visionary journey in a cabin plane, with my companion, a young newspaper friend, making his first air tour. 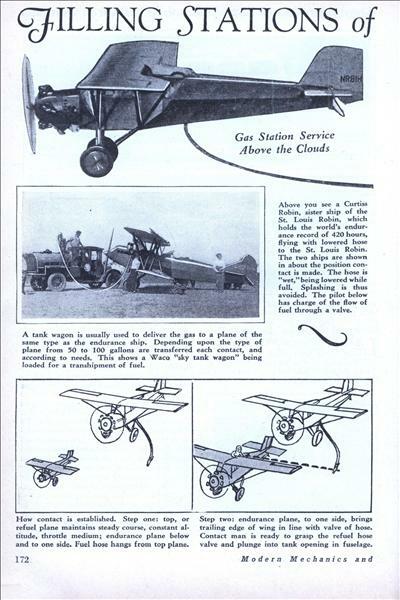 We rode in the cabin of the plane, carried our luggage in the baggage compartment and caused no little commotion as we began our trip from a landing field near New York City. 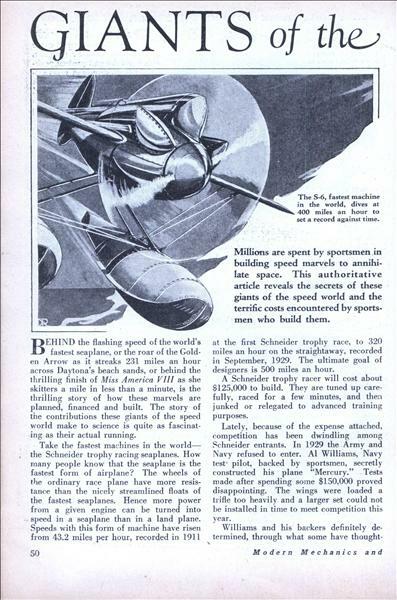 How Fuel Is Passed From One Plane to Another to Keep Record Shattering Endurance Flyers Aloft Hour After Hour Ever wonder how endurance flyers managed to take on fuel, oil and food when on their record-breaking jaunts? 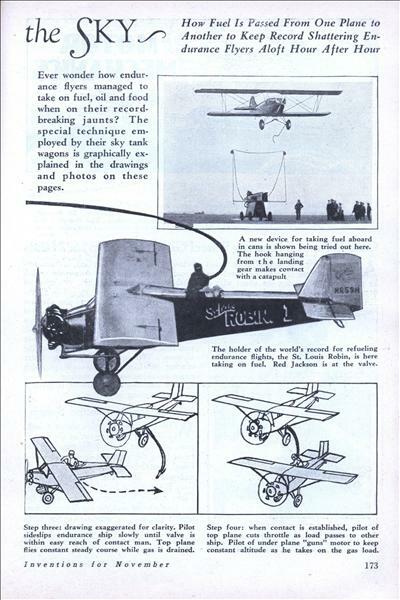 The special technique employed by their sky tank wagons is graphically explained in the drawings and photos on these pages. 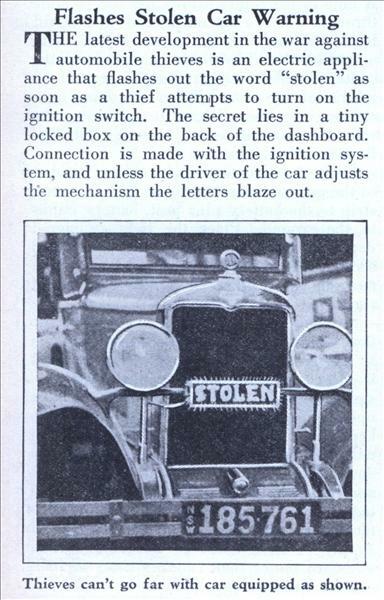 STEADY nerves and a keen eye are required to accomplish this trick shown at left. 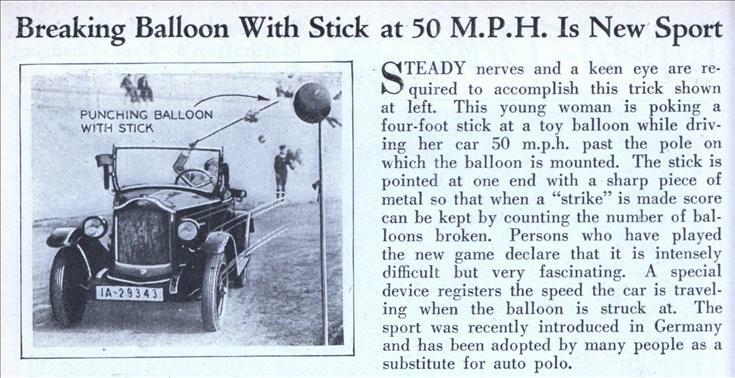 This young woman is poking a four-foot stick at a toy balloon while driving her car 50 m.p.h. past the pole on which the balloon is mounted. The stick is pointed at one end with a sharp piece of metal so that when a "strike" is made score can be kept by counting the number of balloons broken. 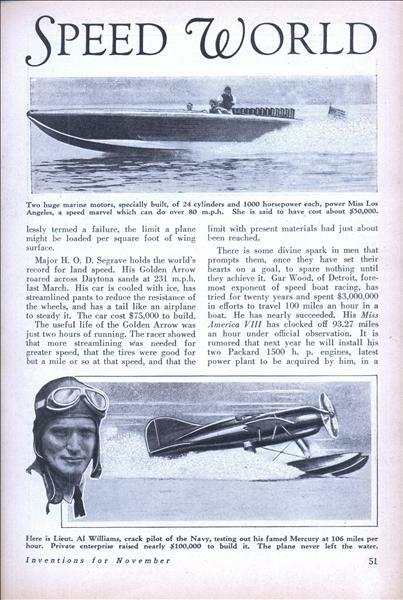 Billie Bomar, flying stunt man, gambles with death for a profession. His job is to provide thrills. 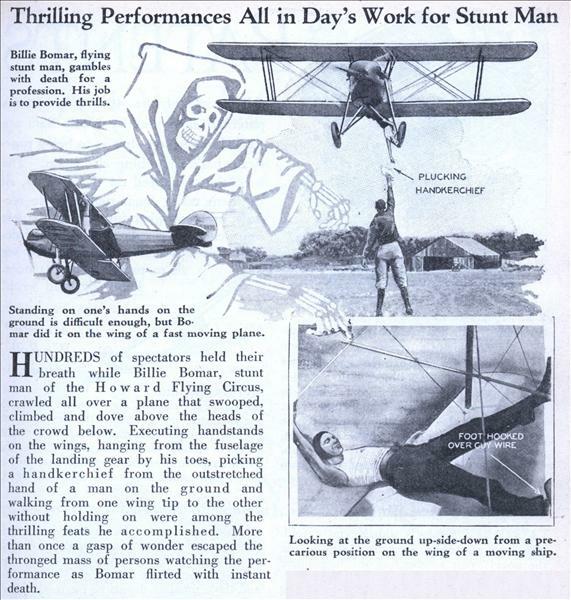 HUNDREDS of spectators held their breath while Billie Bomar, stunt man of the Howard Flying Circus, crawled all over a plane that swooped, climbed and dove above the heads of the crowd below. 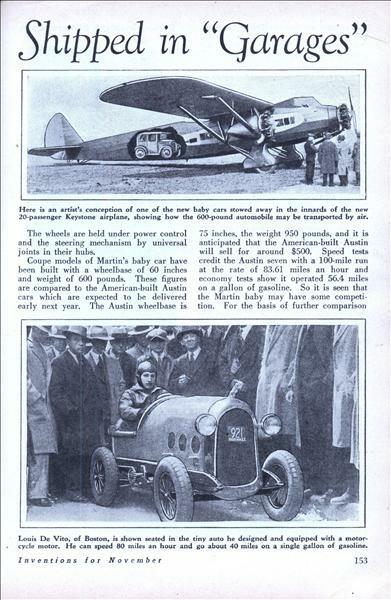 Baby Cars for $200 Shipped in "Garages"
World's tiniest auto is 60-inch coupe with four-cylinder air-cooled motor and does 50 miles on gallon of gasoline; midget cars may be used as tenders for smaller and cheaper airplanes. 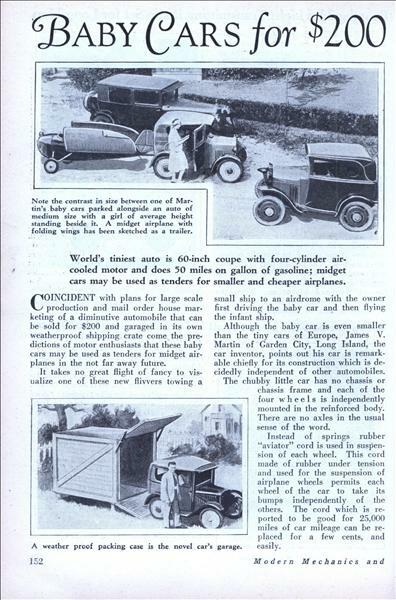 COINCIDENT with plans for large scale production and mail order house marketing of a diminutive automobile that can be sold for $200 and garaged in its own weatherproof shipping crate come the predictions of motor enthusiasts that these baby cars may be used as tenders for midget airplanes in the not far away future. By R. D. ADAMS The mechanic who made Houdini's Trick Magic Apparatus Harry Houdini, Prince of Magicians, carried with him to the grave the secrets of his extraordinary feats of illusion. 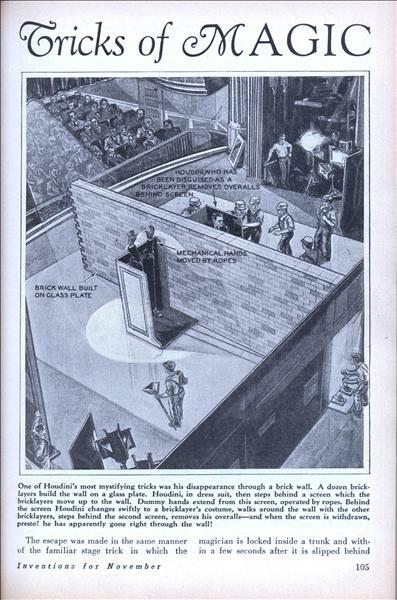 Only one man, the artisan who made his magic apparatus, knows the working secrets of Houdini's most mystifying stunts. That man, Mr. R. D. Adams, continues here his fascinating expose of the master magician's methods. 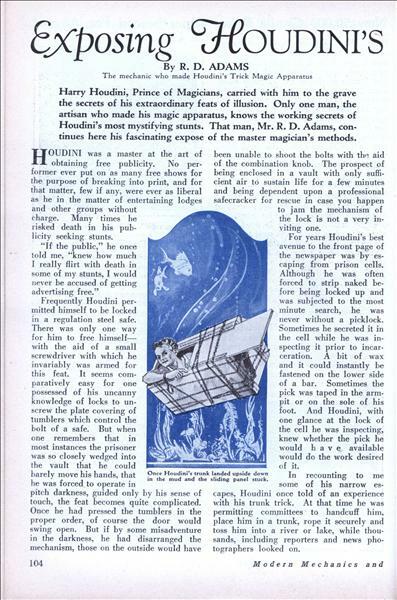 HOUDINI was a master at the art of obtaining free publicity. No performer ever put on as many free shows for the purpose of breaking into print, and for that matter, few if any, were ever as liberal as he in the matter of entertaining lodges and other groups without charge. Many times he risked death in his publicity seeking stunts. 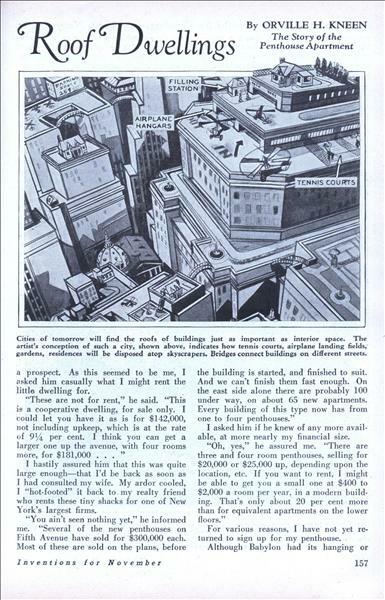 By ORVILLE H. KNEEN The Story of the Penthouse Apartment Roofs of metropolitan skyscrapers are now the most sought-after and expensive sites for exclusive apartment dwellings. Rentals for some of the roof houses range around $2000 per room per year! 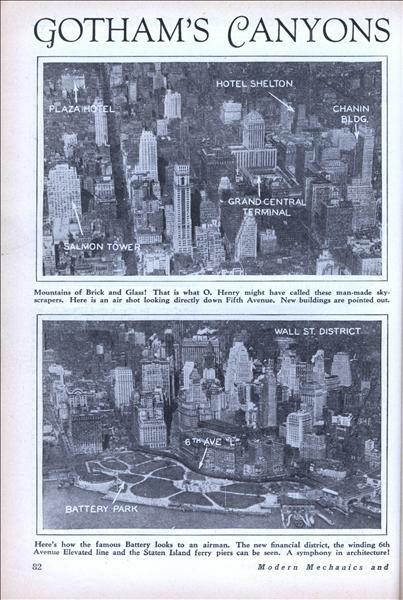 I HAVE heard much about New York penthouses lately. 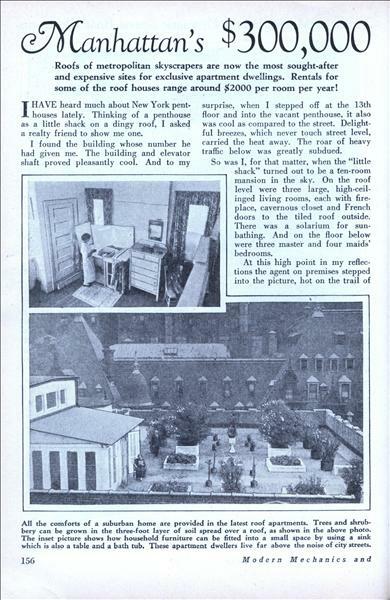 Thinking of a penthouse as a little shack on a dingy roof, I asked a realty friend to show me one. New Machine Delivers Fresh Bread Loaves Ready Sliced. Housewives can now buy fresh bread all sliced and ready to serve. 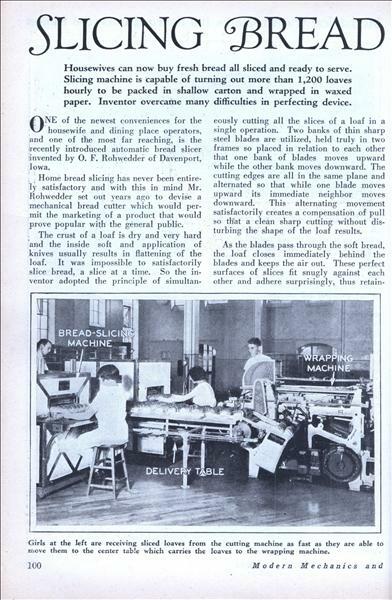 Slicing machine is capable of turning out more than 1,200 loaves hourly to be packed in shallow carton and wrapped in waxed paper. 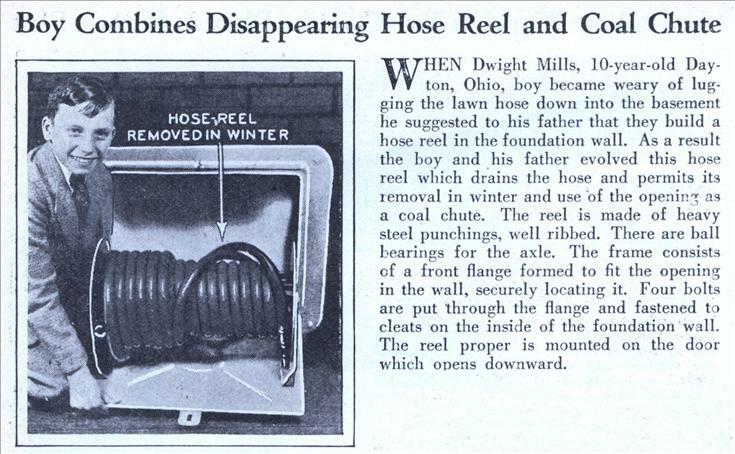 Inventor overcame many difficulties in perfecting device. 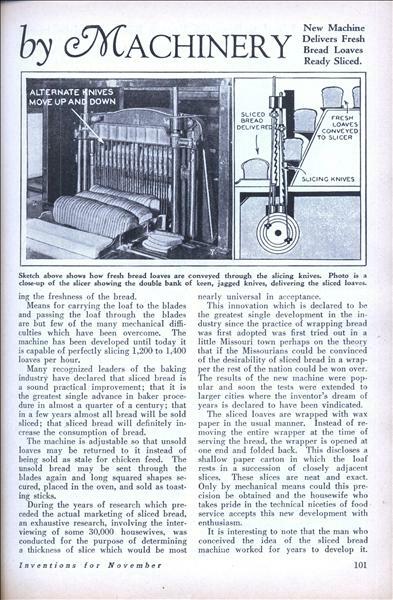 ONE of the newest conveniences for the housewife and dining place operators, and one of the most far reaching, is the recently introduced automatic bread slicer invented by O. F. Rohwedder of Davenport, Iowa. ONLY one out of a thousand residents of Chicago realizes that his city has an extensive subway system. No people ride in this subway, however, except the operators of the trains, for it is purely a freight subway. 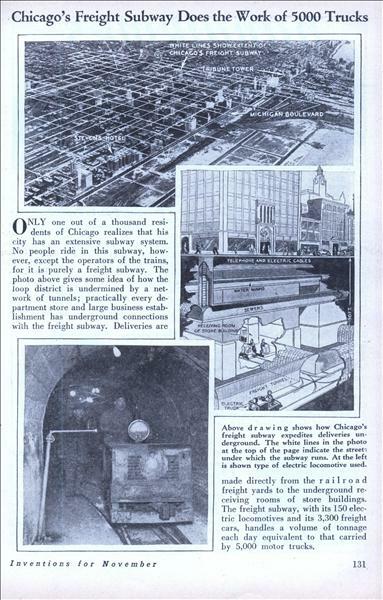 The photo above gives some idea of how the loop district is undermined by a network of tunnels; practically every department store and large business establishment has underground connections with the freight subway.